Mindfulness has become a popular concept in today's bustling world, especially for children. It's about living in the moment and taking notice of the little things in life. 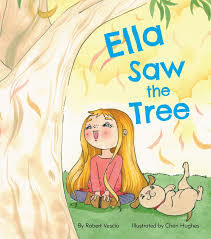 Here, Ella is so busy creating and exploring that she has never really noticed the tree in her back yard. When she finally sees the tree while playing outside one windy day, Ella is convinced the tree is crying as it showers leaves on the ground. To understand the beauty of the tree and the elements of nature, Ella's mum teaches her to sit still, breathe deeply and notice the things around her. This is a lovely way to teach younger children about using their senses to discover the natural world and the power it has to bring joy and serenity into their lives. Robert Vescio's beautiful use of language makes this an enjoyable book to read out loud, while Cheri Hughes captures the magic of the tree with her soft palette and whimsical style.